august 1, 1999 What a weekend I've had. Remember I mentioned my new counter? Well, I used one of those editors that will change the code on many pages at a time. I used it. But it didn't go well. For some reason, some of the code came through corrupted. Mind you, I cancelled my old counter and had most of that code removed. The problem with the new corrupted code is that Internet Explorer is a very unforgiving type browser and lets the viewer know when there's a code screwup. I got email. "Your code is bad." I was told last night, around 7. So, I worked on it last night until eleven, it's now after three in the afternoon and hopefully, I caught all of it. What a major mess it was. There was no way to tell which page was bad and which wasn't without viewing each page. My back is stiff and I'm so tired. If you happen to come across any, let me know so that I can fix them. LOL!! I just recalled that last week, knowing that this was gonna be work, just not how much, when I was telling Brian about it he said "just get rid of some of your pages". Yeah, right, like that's gonna happen. *grins* He doesn't have a clue how much is here. It's getting warm right now. I just closed the house up and turned on the A/C. We're having a roast tonight. I have to get to the store and get some spuds. Brian requested this meal last weekend. And Ciara is progressing very nicely. She's running and playing when it's cooler. I'm so glad. And she seems to be putting on weight. I wonder if she'll get any longer. august 2, 1999 Last night, when I gave Ciara her pill, I dumped them out into the palm of my hand to see how many days were left. Of course, I didn't look at the bottle. Boy, there were a lot of pills. Then I looked at the label. Twenty eight pills, one a day. Hmmm..... Four weeks? Maybe Buddy was on medication for that long after his pancreatitis, but I don't recall any of the animals being on meds that long. I called the vet this morning and that's right. And Ciara fights medications. But the pills are definitely easier to get down her than those nosedrops were. I dreaded giving her those drops. She really fought them. Her snuffling has gone down. And she's starting to purr more easily. Brian said this morning that she won't let him hold her. I was kind of surprised. It looks like we have another mama's girl. But she's so sweet and so soft. And like Benny, she rolls over for belly rubs when she thinks she might get one. Oh, I set up a couple of pages with the previous four hours of webcam pictures. All of them. Since there are eighty pictures, there are ten pix on a page. I figured that would be easier than just the links, which I still have up. We didn't have roast last night, after I fixed the code (I hope, I hope, I hope) I was too tired to stand in the kitchen and make gravy and mash potatoes and cream peas. So, I opened a can of refries, heated them up, grated jalapeno cheese, stirred up the remainder of the sour cream and heated up some tortillas in the microwave. We had bean and cheese burritos. Then I finished making the bed (I love clean sheets) and started taking care of the pile of clean laundry. I finally took a shower about ten, then went to bed. I slept like a rock. I still have to do the second quarter reports, I *have* to get them done today. So, today is a day for paperwork. Yippee skippee. It shouldn't take too long. I almost forgot... This weekend Brian did a bunch of work on the house. He took all of the stuff out of the entry way and painted it. At one point I looked out to see him talking to one of our neighbors, the one who lives on the west side of us. Nosy me, I go out. It seems the mailman had put some of our mail in their box. It was addressed to me, no return address and bulk postage. Trash. I opened it up. Oh, look, it's the report from the place that did my mammogram. I'm fine. That's nice to know. august 3, 1999 The first cat here for dinner last night was the little red kitten. It's so hard to figure out who his mama is. I hope it's Blue, because she lives behind us. No street to cross. At one point, one of the black cats that lives across the street came running over, but I don't think that she's his mama. Cleo came over a little after dark and when I fed them, I only saw the kitten, Cleo and the black cat. No OC or Angus or Blue. Now, keep in mind, Angus also lives behind us. Well, an hour after I dished up their dinners, they showed up. And a little while after that, I saw the kitten headbutting and rubbing against Blue. And she was grooming him back. I think he's hers. We had the roast last night. It was so good and the smashed potatoes were pretty darn good. I can't believe how much Brian ate. He said "you pile it on the plate and I'll eat it all." I did and he did and he even went back for seconds. I thought we'd have a bunch of leftovers, but I was wrong. When I had the dishwasher running, the pots and pans washed and drying and I was standing over the hot sudsy water with the scrubber in my hand, washing the bottom of the crockpot, I remembered something Brian had said when he mentioned that he wanted roast. "Hey!" I yelled out to him, "didn't you say you'd do the dishes if I made a roast?" Oh, yeah, that's right. Oh, well. Man, I hate doing dishes. I got a bunch of paperwork done yesterday, paid personal bills. Today, I'm gonna pay business bills and get those out in the mail. Boy, when I let the cats out this morning, Lonee really wanted some attention. I petted her for a while and even though she's a short hair, her fur is really thick and she really should be brushed, but I don't think she'd go for it. She was purring and headbutting and meowing, she was pretty happy. She's a sweet cat when she's in the mood. And I found a Ciara pill on one of the condos yesterday. I didn't see her spit it out, I thought she had taken it. Darnit. Yesterday, she spit her pill out three times before I remembered they go down easier with butter on them. But thinking about it, she had been laying on the same condo yesterday after I buttered her pill....hmmmm........ So was that yesteday's pill or a different day's pill? Brian's not working today. It was a pretty nice day yesterday and he had to pick up his nephew at the airport and take him to Camp Pendleton (the nephew is a new Marine). It took a while to get Jared where he was supposed to be, being unfamiliar with the base. On the way home, Brian called me and said that he *had* given that man the right directions to Willow. Seems there's also a Willow Rd in Lakeside. That made Brian feel better, but it wasn't nearly as funny. I just called Senator Boxer's office. They are still working on the bill and trying to straighten this out before their recess. I was told that they've gotten many calls this past two weeks. I hope they can do something. I wonder when Gracie will get back to normal. Something scared her big time within the last couple of months. She doesn't seem to trust anything she doesn't recognize, like if a blanket hangs down differently, she will stare and stare at it. Maybe she fell off of one that was on one of the entertainment centers. I miss Bobby at dinnertime. I miss him when I walk into the tv room and there's somebody else sleeping in his condo. I miss his middle of the night meowing to be put back up. I miss sharing pieces of my meals with him. I miss saying "hey, Wubbers, how's my big boy" and giving him nuzzles. Yesterday, somebody posted on the cat's health board about their cat having been put to sleep and how awful it was, because the cat fought it. The cat was seriously ill, only having been diagnosed with cancer about three weeks ago. It was quick, like Bobby's demise was. Anyway, from her description, now I'm really glad my vet started to sedate before euthanasia. My email isn't working this morning. I hate it when that happens. Oh, good, there it's going. Oh, that "vet" hasn't posted on the boards since somebody posted they were going to report him/her. LOL!! august 6, 1999 Wednesday night, the dogs were going nuts, barking. I went out to see what their problem was and it was a young possum on the back fence. I was almost eye level with it. It couldn't get into our yard because of the barrier Brian put up for Benny and it couldn't get to me. But it hissed at me. Poor little thing was probably scared stiff. Anyway, I shooed the dogs away and when I went back, it was gone. The dogs settled down. Then, last night, the dogs start their yapping again. Brian went out and put the collar on Buddy. I took it off this morning. Buddy doesn't like that collar, but we can't have him barking all night. And when he doesn't bark, Junior doesn't bark. And we don't upset the neighbors. Ciara is feeling much better. She's outside now, playing and running and jumping. Earlier, I saw Maggie, Ciara and Benny, all lined up at the top of the bank, looking through the chain link into the yard next door. Probably kitty watching. The difference in Ciara's face since her surgery is amazing. I can't get over the difference. How badly that polyp must have been pushing on her nose. Before, her profile was pretty much straight. Now, she has a little ski jump nose. She was so swollen under her eyes up into the bridge of her nose. And it looks like the buttered pill is the way to go. It went right down yesterday. Somebody in the neighborhood, on one of the hills around us, got a new puppy. And I guess that puppy is outside, alone, all day long. That puppy cries all day long. That puppy was crying last night at 7:30. Why do people get animals if they aren't going to be with them? Even though our dogs are outside dogs, we spend a lot of time outside with them. And I'm right here with the door open, pretty much all day long. Poor little puppy. Probably just lonely. As I've mentioned, Brian is repainting the house. He's now working on the entryway. Last weekend, we pulled all of the plants out and he sprayed the stucco the lighter blue color, like the rest of the house. And he painted the trim and facia boards white. 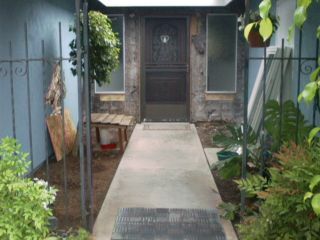 Now, the area around the front door was stucco. Brian thought it would be more appropriate to have the same type of wood siding that's on the very front of the house (I have a before picture from years ago, I'll put it up with an after picture when he is finished), by the front door, painted the darker blue like the shop and the front of the house. He already has the wood painted. Yesterday, he took the stucco down. The cats did not like the noise when he had the chisel going. Scared them. He didn't have time to put up any of the wood. 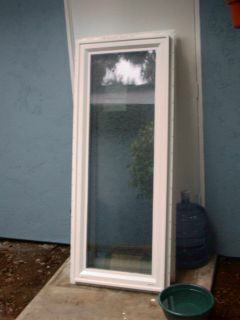 He also got new windows for the front, casement windows, the kind that roll out to open up. What we have now is just glass. This should let more air through. But, then Brian drops the bomb. With the new door, we won't have a screen door. WHAT!!??!! Brian, we have to have a screen door. You can't expect me to live without the front door opened on nice days. I just can't even imagine that. Besides, the screen is an additional barrier for the cats to jet out. No, I'm sorry, we need a screen door. I like having the front door opened. So, he said, well, I guess I can special order one. Okay, then do it. He did and last night he told me it might take two weeks to get the door. Two weeks without a screen?.....uh, I don't think so. I'm thinking, why can't he wait to put in the new front door? He said that he would try to make our current screen door fit until the new one comes in. Thank you. It isn't like we haven't talked about this within the last six months. The new screen door should already be here. *sigh* It isn't like this was a big surprise. Yesterday, I put up directions for the puzzles at Benny's. Puzzle number five is me as a little girl. Such a darling. *LOL* Yeah, a real brat, according to my mother. A troublemaker from day one. I also got a new game running, checkers. But this is a little different than the other checker game available. This checker game you need another person online to play with. You don't play the computer, you play a friend. And there's a little chatroom to talk with your opponent. Cool, huh? We had a salad for dinner last night. And we had homegrown cherry tomatoes. Brian said the tomatoes were really flavorful. My complaints about our recent salad dinners is that they need avocado. Last night, he agreed. Somehow, even though there isn't a lot, the avocado just adds something to the texture/flavor/experience. And avocados have good cholesterol. Even though they are so expensive right now, maybe I can talk him into buying some at CostCo next time we go. august 7, 1999 Man, I'm beat this morning. Yesterday, I noticed that my LV Designs directory had a bulletin board in it. Cool. So, I played with it and really screwed it up, so badly that it wouldn't work. I kept getting an internal server error. Darn it. I emailed the web host and thanked him for giving it to me. He wrote back that he had a newer version in a different directory. Cool. That one almost worked right, so I tried to change what I knew was wrong. What!! I couldn't change anything in it, I had no permissions. He blocked me out, the bum. Probably figured I'd make a mess of that one, too. Well, come on, I needed a background, not just white, I needed to rename it, what kind of a name is "WWWBoard Version 2.0 test"? Spit. So, I went to another site, redownloaded the code and was vewwy, vewwy careful with what I was doing. It took hours, but I finally got it to work. I was so excited!! I went over to Acme and said "hey, guys, I put up a cool new forum, just for cat fights!! Where people can argue all they want and those who don't like reading the fights won't have to." Well, after a couple of people posted, I realized that you have to reload to see the new posts, so I added that to the index.html. Unfortunately, by doing this with a new index.html and not using the one that was in use, I lost the links to the posts. Luckily, there were only about six or seven, if that many. Now, the thing is working like a dream. Well, at one point, somebody started to impersonate Benny. I don't really care for imposters, not at all. I mean, you can be as nasty as you want to be, just don't pretend to be somebody else. It really bugs me. I looked around for some code that would help me identify people who do this and didn't find anything. I figured I would sleep on it. Now, I've related my tails of woe regarding receiving the networks via satellite. Last night, after I shut down the computer, I went into the tv room where Brian was channel surfing. We still weren't getting the ABC feeds and he was on the satellite that carries the Denver stations. And it also has Fox Net. Well, we weren't getting Fox Net. We should, because we don't need a waiver for Fox (the local affiliate broadcasts from Mexico) and I'm paying extra for it. What's the deal? I call Netlink. Brian got disgusted that I was calling so late (9:30, they're open 24 hours) and went to bed. Geez, what a mistake that almost was. I nearly lost all of my networks (I still got ABC and CBS on the west coast feed and all three from the Denver feed), because we don't have waivers. Spit. Anyway, after an hour and a half on the phone, we finally got it working so that I got ABC and CBS for the west coast and the east coast (no NBC anymore) and all three networks for Denver. And I also got my Fox Net back. I did learn that effective the end of August, CBS is due to be shut off, along with ABC unless they find my waiver that I sent in March and earlier this week. Dagnabit. Anyway, at eleven, we were done and I turned off the television. Makes a lot of sense, doesn't it? The guy had asked me what show I had wanted to watch and I said none, I just noticed that we weren't receiving a channel we were paying for. Hey, what can I say? I tried reading for a little while, but I just wasn't in to it. I went to bed. Of course, then I started thinking about the new forum, how to keep posers and spammers out. I figured that if I put the code there for the counter, that would show me when people had visited. And I could pretty much figure out what ISP the uncool were posting from. But, I had to do it late, when nobody would be over there. This morning at 3:30, I was back here, adding the code. And it worked. Then when I got up this morning, I found a different background to use. Too many complaints about the first one I tried. Big babies. So, I'm pretty tired right now. The cats are good. I don't see so many out front at once any more, the black ones come earlier. I guess that OC, Angus and Blue wait until the others have left before they show up. And Cleo is getting much more relaxed when I'm out there. If she's outside the gate when I go out to feed them, she will walk in and sit and patiently wait for me to finish dishing out the food. The other night, when I was a little late getting them fed, she was up at the screen, standing on her back legs, peering in......I don't think I've seen a cat do that before. Blue is just getting wilder it seems. Somebody had the runs. Maggie does, I see it on her pantaloons and so does Ciara. I'll watch to see if there's anymore. Even though the catsip isn't supposed to cause this, I think it might, a little. As for Ciara, her problem might be the butter on the pill, something her system isn't use to. Add to that, we've been giving the cats the tuna juice from the can we open up to split on our nightly salads. Another something different. I forgot to mention it last Sunday, but Red has been here for three years. He had pancakes for breakfast in celebration. Brian's gone again this morning. This time he's helping his brother move a trailer. But first, he's supposed to go up to Pendleton and pick up his nephew and bring him down. Camp Pendleton is halfway to Disneyland from here. Of course, I ask if this is going to be a weekly thing. No, I'm told. How is Jared gonna get back to the base? was my next question. Brian explained that he will take the trolley to the coaster station and take the coaster to Oceanside. And from there, he will either have a friend pick him up (if he has any yet, he just got in on Wednesday, remember) or take a taxi. I told Brian "he should see about buying a car". Brian agreed. august 9, 1999 What gorgeous weather we've been having. The temperature is below normal for this time of year. It can get warm when you're in the sun, but it's perfect in the shade, with a light breeze blowing by. Yesterday, after shopping, while I was laying on the couch, reading, windows open, I told Brian "it doesn't get any better than this." Now, some of you may have realized by now that I'm a "glass is half full" type of person and my dear, sweet husband is a "glass is half empty" type of guy. He started going on about how it could be better and listing things out. The first thing on the list was the music from the house behind us. It was awful, in my opinion. And the thing about it was how loud it was. There's no need for it to be so darn loud. We live on a third of an acre and could hear it clearly in our front yard. It wasn't live music, it was recorded. Well, Brian gets up and goes out front. I start paying attention to the music. And it starts to annoy me. As long as I didn't pay attention, it didn't bother me, but now that Brian brought it up........ So, I go around, shutting all of the windows and doors that face that direction. Still bugs me. So, I went outside, there's probably six people sitting around the pool. No more than that. Just chatting. I probably didn't look really happy. I went back inside and within five minutes, the music was turned down. Good. Buddy was pretty good, but when they started playing volleyball, he started barking. We put the collar on him. They quit playing volleyball, we take the collar off. They start doing something else and he starts barking. And once again, when Buddy barks, Junior barks. Buddy ended up with the collar on all night long. I hate having to do that, but keep in mind, this dog will bark while he's eating. Saturday, Brian was gone until late afternoon. I did a little websurfing, went to a site where I had gotten a forum script a little less than a year ago. They have a new one, but I missed the free upgrade by two months. So, I re-ordered it. Found out this morning that the check I sent to the credit card company last Tuesday still hasn't been posted to our account. Dammit. Payment's late and we're over limit. And I relooked at a chat room that I had paid for and downloaded. It looks easy and it also has the ability for private rooms. I'll try to get that set up this week. I don't know why I do this stuff, nobody ever uses it. The guy that set up my first chat room hadn't posted there in over two weeks and it was a working demo for what he offered. What's that tell you? This is the same guy that was going to install my counter, he tried, but it never worked and that's when I went to the script author and he installed it for me. Let's talk a little about huge warehouse stores, like CostCo, and money. *grins* Yesterday morning, Brian sandblasted some stuff for his brother (did very little for the house and I hate that paper and wire by the front door-see picture above). Finally, around two, he was ready to go shopping. Well, the list wasn't that long, cat food for the strays, avocados for our salads, eggs, milk...the staples of life, ya know? CostCo isn't a place that you should go without a check. Believe me. Our ATM has a limit of $300. I figured that would be more than plenty. Wrong. Remember the way cool CD system that Brian gave me for Valentine's Day? And the CD recorder? Well, Saturday, he had called me and said I should make some tapes for his truck. I haven't really been into making stuff like that for a while now. I wasn't too enthusiastic about it. Especially since our new 4DTV also has a ton of commercial free music stations, available by taste. Big bands, easy listening, old country, new country, hit country, 60's, 70's, 80's and 90's rock and roll, r & b, gospel, you name it, it's there. I have it hooked up so that I can listen via the stereo and have the tvs on in the other rooms to have the music "piped in". Anyway, computers and office machines are right as you walk in the door, with home audio/video equipment behind that. They have car CD players. From Blaupunkt. For $129.99. Brian says if we get any, we should get two. One for his truck and one for the car. Let's see, that would be $260 and that doesn't count tax. He asks if I brought a check. No. Didn't think we'd need one. He counts the money in his wallet, I count the money in my purse. Not enough. Darn it. There aren't that many of them left and this is CostCo. It may be months before they have them in again. We went ahead and finished shopping. I started talking about putting stuff back, so that we could get the players. Brian said positively not. Well, I asked the cashier to do a subtotal before we got to the stereos. We were at $195. We didn't have enough. Spit. So, we go ahead and checked out, went home, unpacked, I grabbed the checkbook and back we went. Now, we have the stereos. Brian can install them. Whenever he gets the time. I've been a little worried about Pepper. She isn't acting any different, I'm just a little worried about her. It may just be because she's had so many hairballs. We played for a long time last night. She was having a lot of fun. We both were. And Rusty has had this black freckle on his ear for years. Saturday, I noticed that it also has a bump to it. I said something to Brian and he said to watch it and see if it grows or changes in anyway. Montel Williams is directing a movie that at this point in time is named "Little Pieces". It's about a woman who finds her cat dead. Well, it seems that this cat is all that she had in her life, her only friend. That's about all I know of the movie, which I found out last month. It seems that they have an artificial cat, but no real cat. I wouldn't think they needed one since the cat isn't alive. 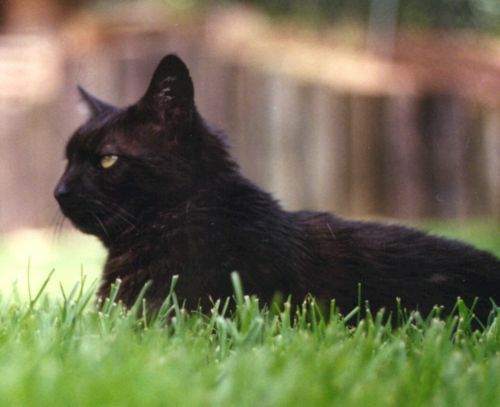 Anyway, it seems that Boney looks just like this artificial cat. There was email going back and forth between myself and one of the men who does the props. They needed pictures. Could I get some of Boney and send them? They wanted them for the "memorial" of the cat in the movie. And time was of the essence. All of this came out in the emails. At first, I was reluctant, because the person with whom I was responding sent two wrong email addresses for return mail. And one email, that didn't bounce, was from a university. I thought "okay, a young man, in college, wants pictures of a cat...could this be some sort of sick joke? Am I gonna find pictures of Boney, modified, that will upset me?" The young man was able to set my mind at ease. Anyway, I took three rolls of film, not all of Boney, of course, how on earth could I take so many different pictures of him in two days? And I had to try to keep things out of the background like the pool. And I went through all of the old photos, looking for earlier pictures of him. I found quite a few. I didn't know if they would be good enough, my flash broke and I had to work with available light. Saturday, I got a letter with a ten dollar bill in it (reimbursement for film and processing), letting me know that they had the pictures and that "Montel liked them" and that they would be using most of them. At the end of the film, in the credits, they are going to mention Boney. Cool. Boney. In the movies. I've had problems with the miva messageboards for a while now. I thought it was just me, but last week, I got an email telling me that Ciara's board was garbled. Now, this has happened a few times, but like I said, I thought it was just me. Still, I notified Simplenet about the problem. And I found that by hitting reload/refresh a couple of times, it would fix it. Friday, it did it again. On almost all of them. And going in to read a message, it started looping an error message. Only by hitting escape or stop, could I stop the looping. It probably would have gone on indefinitely. I filled out Simplenet's trouble form. And I copy and pasted the error message on the front of the board. They emailed me back. I emailed them asking them about the looping error message, explaining it to the best of my ability. It seems there was an error in their program and it's been fixed. I surely hope so. The messageboards seem to be loading a little more quickly, too, but that might be my imagination.